There are few days as important as christening. With graduation, marriage and retirement, the christening day marks a milestone in the walk of life of a newborn. And this day, deserves to be remembered as it should. The traditional gift theme for christening for boys and girls is silver presents. Godmothers and godfathers may choose to give silver christening gifts on this day. Silver is precious, shiny and easily shaped into different elegant objects: very appropriate for such an event. Moreover, it is very easy to personalize silver gifts to create a unique present. A present that will always be remembered by godson or goddaughter will be taken good care and pass to the next generation. Having difficulties in choosing a gift? 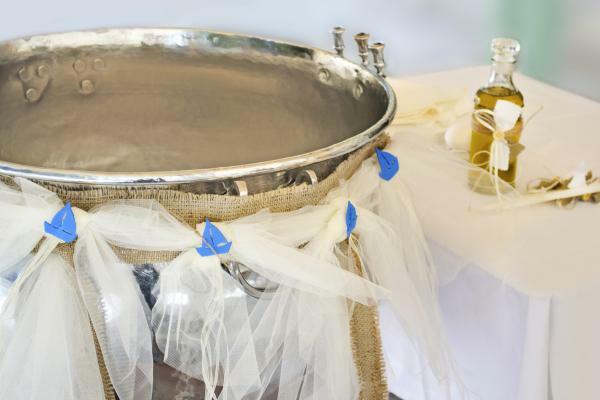 If you can’t decide, don’t worry: we have gathered some of the best silver gift ideas for christening(or baptism) to make your life much easier. What is christening? Are christening and baptism, 2 words for “same process”? Although technically different, in today’s world, we see that the usage of the words “christening” and “baptisms” are used interchangeably. If we want to be more excact: Christening is the name of the process during which the child is given a name; where as baptism is the first and basic sacraments of Chrisian initiation according to the Catholic Church. “There is no difference between a christening service and a baptism service. Some churches will use the word ‘baptism’ and some the word ‘christening’. Historically, silver is at the root of our monetary system: the US dollar and British Pound are both defined with silver. Although no longer used as money in our daily life, a silver coin set has a long-lasting value as it has no counterparty risk: 1 ounce of silver is always 1 ounce of silver, even 100 years hereafter. You may choose a silver coin set with 3 or 5 coins with beautiful designs: Silver Eagles, Silver Maples, silver Australian Kookaburras or Silver Britannia’s are good choices. You may find more variety if you choose to look into rounds, which are produced by private mints: silver Pharaohs, silver pirates: you will be surprised with the vast number of alternatives. A last tip for silver coin sets: choose a set with wooden box, which will not only protect the coins for years but also help them stand out in gifting. Cufflinks are at cornerstone of gentlemen’s set of accessories. A tuxedo or exquisite suit demands the last touch with a set of silver cufflinks. Make sure you choose a set of hypoallergenic sterling silver 925 cufflinks so there won’t be any discomfort experienced by men with sensitive skin. If you are looking for a christening or baptism gift for a baby girl, a silver bracelet is the perfect gift. Choose a silver bracelet with name plate and have her name engraved. This unique and personalized gift will be remembered for years. You can be sure that the silver bracelet will always be part of her jewelry armoire. A silver cup is a perfect gift for christening for a baby boy or girl. Have his/her name and date written of the cup to make it more special. As a silver cup, a silver flatware set is also in ideal gift for christening. You may choose from 2-piece or 3-piece flatware sets. Make sure it is made from Sterling Silver 925. And as before, you can personalize it by having engraved names. Important memories demand more care and a silver frame which will carry photographs of those moments is an elegant touch in all living rooms or working desks. A silver photograph frame you will gift, will be always looked for and present in important places in front of everyone’s eyes. Leaders are readers and readers are leaders. True to the word. However, event avid readers need bookmarks. Choose a silver bookmark and have the receiver’s name engraved to create that unique gift you are looking for. How to create an unique personalised christening gift? You can always personalize your gifts to create a truly unique one. The classic way o personally crafting your gift is engraving the receiver’s name or initials. Think of engraving your godson or goddaughter’s initials on the silver fountain pen or engraving his or her complete name on the silver baby cup. You may also add the date, place and if appropriate, the event. A more sophisticated way to differentiate your gift is having engraved your best wishes with a small poem you personally wrote. Think of a silver plate with four lines you did write; that’s a gift to be cherished forever. Choosing a silver gift for christening is a fail-proof way. After all, silver christening gifts are not only for godparents. From silver cups to silver bracelets to silver bookmarks, there are many good choices as a gift for christening of a baby boy or girl. Moreover, it is also very easy to personalize your gift by engraving his or her name adding your best wishes.